Are Your Ready for a Challenge?? 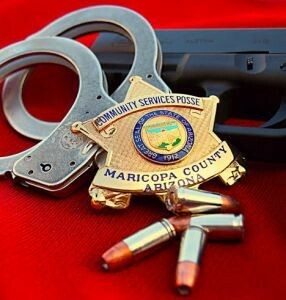 The Community Services Posse, more commonly known as “Comserv” is a group of highly trained volunteers who donate their time and equipment giving back to the citizens of Maricopa County by assisting the Maricopa County Sheriff’s Office Deputies as well as various other law enforcement organizations in Arizona. The Community Services Posse is an all volunteer, non-profit organization. We provide law enforcement, crime prevention, and community support to and under the direction of the Maricopa Country Sheriff's Office. The members form a multi-disciplinary force with a goal to render assistance to the Sheriff's sworn personnel and the citizens of Maricopa County. The Community Services Posse was awarded 2017 posse of the year. We are very proud of all of our members and this amazing achievement.